The majority of us lead pretty stressful lifestyles nowadays, so it’s little wonder most of us get stressed out at times. A hectic career, financial worries and relationships issues are just some of the common causes of a rise in blood pressure, and as well as making you feel rather rubbish, these things can also start to have an adverse effect on your skin. If you’re feeling a little less than calm, relaxation is the key. An early night, spa pamper session, chilled night with friends and an evening in front of the TV with a big bar of chocolate can all help to restore calmness. A long and relaxing soak is the bath can also work wonders and help to soothe stress. 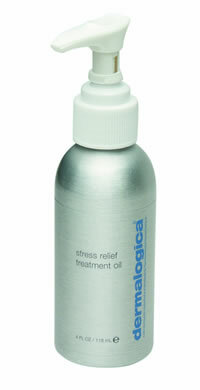 Add a little Dermalogica Stress Relief Treatment Oil to your bath for the ultimate relaxing home spa experience. When we’re feeling stressed, spots can start to appear- which can make it all too easy to get even more worked up. However, by arming yourself with a cleansing face masque, effective cleanser and light moisturiser, you can stop spots in their tracks. Dermalogica Skin Refining Masque, Dermalogica Special Cleansing Gel and Dermalogica Active Moist moisturiser could be just the products to tame traumatised skin and help to get you on the right track to feeling back to your best.